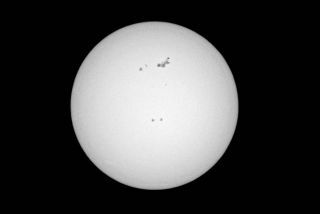 Skywatcher Kenneth Farmer took this photo of the sun showing AR1429 sunspot region on March 7, 2012. He says: "I live in San Francisco and took this photo yesterday through a telescope (with a solar filter) of the AR1429 sunspot region. This is the area that generated the massive solar flare." This story was updated at 3:36 p.m. EST. The sun is continuing its active streak this week, firing off another solar flare late Thursday (March 8) from the same region that produced this week's strong solar storm. An M6.3-class solar flare — a mid-range eruption — spewed from the surface of the sun last night at 10:53 p.m. EST (0353 GMT March 9), according to an alert from the Space Weather Prediction Center, a joint operation by the National Oceanic and Atmospheric Administration (NOAA) and the National Weather Service. The M-class solar flare exploded from the same sunspot region, called AR1429, which has been particularly active all week. This dynamic region has already unleashed three strong X-class solar flares. On Tuesday (March 6), two powerful X-class eruptions triggered the strongest solar storm in eight years, Bob Rutledge, head of NOAA's Space Weather Forecast Office, told reporters today (March 9). A fast-moving cloud of solar plasma and charged particles, called a coronal mass ejection, was triggered by the Tuesday X-class eruptions, and this wave of energetic particles hit Earth yesterday. The resulting geomagnetic storm was weaker than expected, but solar physicists say there is a potential for conditions to escalate. "We still have about a 40 percent chance of seeing another X flare," Rutledge said. "We still think it's fairly likely to see one later today, tomorrow or the next day. We're watching this region closely." A coronal mass ejection from last night's flare is also approaching Earth, and while this one is expected to hit Earth directly on Sunday (March 11), experts at the Space Weather Prediction Center are not anticipating the effects to be very severe. "[It] could cause storming levels that could reach the G3 (strong) level again, but we don't believe it will have quite the sustained intensity," Rutledge said. Still, the massive sunspot region shows no signs of quieting down, and earlier today, NASA scientists said that it also appears to be growing. "Sunspot AR1429 keeps getting bigger! It's more than 7 times the width of Earth," scientists with NASA's Solar Dynamics Observatory said via Twitter. With this sunspot region now facing Earth, at the central meridian of the solar disk, strong solar eruptions have the potential to wreak havoc on the planet. Big coronal mass ejections that hit Earth head-on can potentially knock out power grids and disrupt other electronics infrastructure. Strong solar storms can also disrupt satellites in space and pose radiation risks for astronauts aboard the International Space Station. This week's solar storm increased levels of solar radiation and caused geomagnetic storms on Earth, but the effects were milder than expected. As a precaution, commercial airliners re-routed flights over Earth's polar caps, but no other major disruptions were reported, Rutledge said. Solar storms can also amp up displays of the northern and southern lights, enabling people to see them farther south than normal. Yesterday, skywatchers reported seeing auroras from states such as Wisconsin, Michigan and Washington, Rutledge said. But without any additional eruptions from the sun, and as this week's solar storm begins to taper off, the supercharged aurora displays will begin to decrease around the globe, he added. The sun appears to be coming out of an extended lull in activity in its 11-year cycle. The current cycle is known as Solar Cycle 24 and solar activity is expected to ramp up toward its peak in 2013, NASA officials have said.